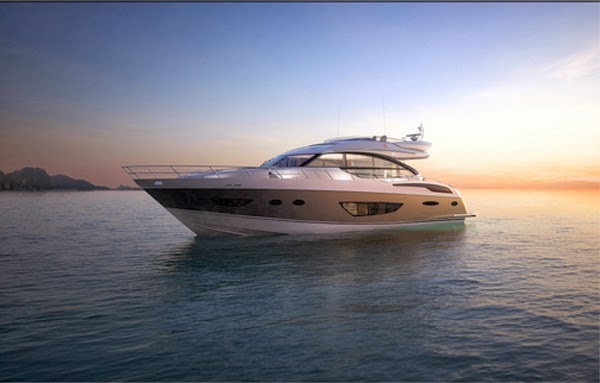 In February 2014 Princess will launch the first model from its new S CLASS range – the Princess S72. Fitted with twin Caterpillar or MAN engines from 1622hp to 1800hp, the S72 is a Sportsbridge yacht that will handle every bit as well as she looks. A proven deep-V hull and low centre of gravity will deliver class-leading ride quality, with speeds expected to pass 37 knots, along with a highly efficient cruising range. The Sportbridge is accessed by a contemporary stairwell, designed to allow an uninterrupted view aft from the deck saloon, and delivers a level of space and sophistication that would put many conventional flybridges to shame. In the cockpit, the Princess design team have created a 3.9m tender garage, able to take a jet RIB plus a whole range of toys. Above the garage lies a vast sunpad area, and there is still plenty of room for a deep and wide surround of cockpit seating and a full wet bar. For maximum on water lifestyle, the deck saloon is designed to flow into the cockpit, creating a vast one-level living area. The saloon’s triple aspect glass doors fold away to port, while a drop-down window, as seen on the V72, completely opens up the aft saloon. For even more on-water atmosphere an optional opening sunroof can be specified above the lower helm and forward seating. With the first S72 already in production, and the S80 is scheduled for launch in 2015, with two more S CLASS models planned. Navnit Marine - a 'Navnit Motors' Group Company, gives a wide choice to their customers for pleasure boating right from 17 footer Boat to 80 meter yacht, representing the Best Brands in the world yet competitively priced. We have a wide range of Sport boats, Fishing boats, Sailing boats, Inflatable, JetSki, ATV`s etc., and host of other Marine products & Equipments. Navnit Marine represents Princess Yachts - one of the world's finest production yacht builders, Bayliner brand of speedboats & Cruisers, Meridian Yachts and TROPHY brand Sports fishing boats manufactured by U.S. Marine, a division of the Brunswick Family Boat Co. Inc. of USA. We also deal in SESSA brand from Sessa Marine Srl- Italy, NOVURANIA, a US Brand, rigid inflatable boats, HARRISFLOTEBOTE (Pontoon Boats) of USA, Mercury inflatables, and AirBerth Lift System from Australia.